Today author David Burnsworth takes over our blog: "A Horse Is A Horse, Of Course". His latest novel is Bad Time To Be In It (9 March 2018, Henery Press, 218 pages), a Mystery, book two of the Blu Carraway Mysteries series. My Blu Carraway series is set in Charleston, South Carolina. Blu owns a small barrier island south of the city that his great grandfather purchased a long time ago. With the island came a small herd of Carolina Marsh Tackey Horses that refused to leave. Blu, not the pet owner type, initially just tolerates them. One of the fun parts of writing is being able to watch my characters change. 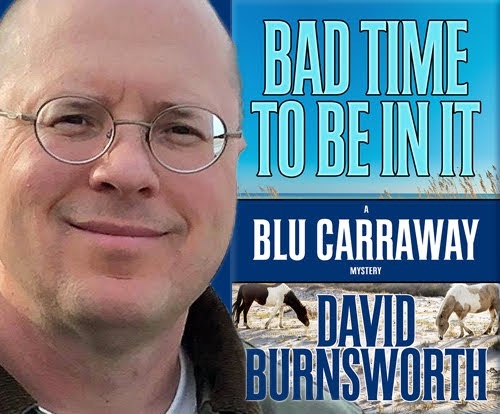 BAD TIME TO BE IN IT is the latest Blu Carraway adventure. What I found so interesting is how Blu’s attitude toward the horses evolves. While Charleston itself plays a big part in my books, I wanted the horses to become characters in their own right in as much as horses can be without becoming unrealistic. The way they look at things is the island is their home, too, so they are going to defend it just like Blu would. Without giving too much away, I had a lot of fun writing their part of the story. In fact, they made so much of an impact that my publisher chose to put them on the cover. A horse is too large to be considered what most people would call a “pet,” at least to me anyway. Their presence alone demands attention. I imagine owning one becomes more of a hobby and requires a much larger percentage of the owner’s attention. What I liked about having a small herd of them is that they become their own caretakers. But we all experience times in our lives where we need help. As much as Blu needed the horses’ help to defend their home, they need his. A black stallion named Murder is the leader of the herd. A bit crazy, Blu gives him a wide berth. Dink and Doofus are two members of the herd that aren’t afraid of anything, but aren’t the brightest, either. They greet most visitors by standing in their way until someone gives them a treat. I have the most fun writing these two because of the mark they leave on Blu’s guests. If someone becomes a return-guest, they know to bring fresh produce for them. Find out for yourself how all the horses help Blu Carraway Investigations close another case and look for more of them in the next Blu Carraway adventure.